The moment I knew Bali was on the agenda I started a bucket list of places/things/activities I MUST do while here. At the very top of this list sits Lempuyang Temple. You'll also hear the first temple referred to as Gates of Heaven. Per the usual, I've read every blog and travel site looking for the best information to plan the trip. 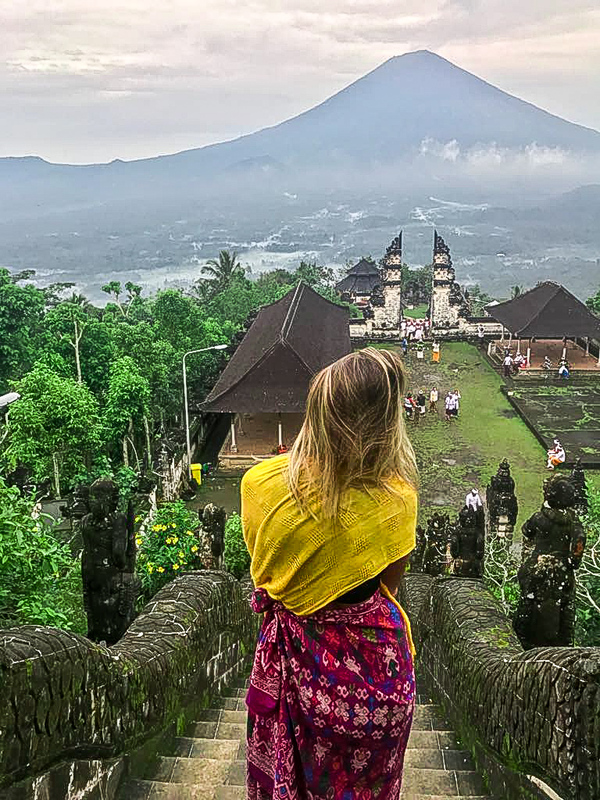 Pura Lempuyang Luhur is located in east Bali, sitting on Mount Lempuyang 1,175 meters above sea level. There are seven temples that make up Pura Lempuyang, the largest and most grand being at the very top. A total of 1,700 steps to get there. The walk is meant to be very spiritual and I've learned Hindus think "those with a heavy heart" won't make it to the top. Complaining about the steep walk and hundreds of steps is looked at as weak and disrespectful. From Canguu, the trip is about 2.5 hours with traffic. I was able to find three other Roamers up for the adventure. Round trip we paid a total of 600,000 RP ($11/each). The driver picked us up, waited for us while we explored and dropped us back off at Bona Kubu. When we arrived to Mount Lempuyang we were greeted by staff and I was surprised to see we were the only tourists around. My research clearly didn't pay off. Staff was quick to inform us our outfits were not going to suffice. Sarongs are a requirement to enter the temple and shoulders must be covered (this applies to men and women)... So much for wearing a cute outfit. Luckily for us, they're prepared for the unprepared and have sarongs available for rent at 10,000 RP (0.75) a piece. NOTE: I'd recommend taking your own sarong and scarf (to cover your shoulders.) It looked like they didn't have a lot so I assume during heavy tourist season they run out quickly. The entrance fee into the temple is a donation. I believe I donated 8,000 RP. The temple itself is surrounded by mountains full of lush greenery. Tropical flowers are in full bloom and green moss coat each step and temple. The air is clean but still thick from humidity. We left at 3:30 am so we could see the sunrise. In the afternoons it gets very cloudy and we were wanting a clear sky to view Mount Agung (the active volcano in Bali.) The volcano became active again on Monday so we could see the ash but it wasn't billowing out like it had in December when it erupted for the first time. The sun wasn't up for long before temperatures reached a near 80 degrees. I was really glad I took water with me but there were several stands selling snacks and refreshments. The most photographed portion of the temple is the very first stop (pictured above.) Around 30 steps to get to Gates of Heaven (no sweat.) The view from down below and once we got to the top was incredible. Mother Nature happened to be on our side as it was extremely clear and we had a perfect view of Mount Aguna. For a short period of time as the sun was rising we could see the a pink glow over the volcano. Majestic doesn't begin to describe the scene. We all snapped some iconic pictures but I feel the images really don't do the gates and the view justice. Aside from roosters crowing (Do roosters crow? - I should know this) around the temple, I felt so at peace. There is a calamity about being so high in the sky and looking at a volcano that holds so much power but yet isn't at all frightening. I tried to mentally capture this view so I can hold onto it forever. It really is a little slice of heaven. We decided since we were already there we would venture to the next temple. Before entering they require each individual to be blessed. We individually go up, open our arms and they sprinkle holy water on us. It was a special moment for me. When walking past the Gates of Heaven there were a dozen men on motorbikes offering to give us a ride to the next stop for a small fee. Having no idea what we were getting ourselves into, we kindly declined. WOOF! Talk about a steep mountain climb. <-- I'm NOT complaining, just trying my best to describe the situation. I was out of breath and wishing I would have brought athletic shoes and paid for the motorbike ride. My Birks were not handling the walk well. On the walk up we were greeted by the two cutest and most playful puppies and ....monkeys. Monkeys.... I don't like em. They're not cute and to be honest, they're jerks. You're not allowed to look them in the eye or they'll bite you, they get in your bags and steal your stuff and they're just....I have no words but know I'm scrunching my face in disgust. I held on to my backpack for dear life and power walked right past them. In my next blog post I'll share all about my experience at the Monkey Sanctuary in Ubud. The anxiety was so real! We ended up walking right by the next temple without even knowing it and started a massive stair climb. By this time my legs were on fire, I was out of breath and soaked from sweat. Such a pretty picture. We ended up spotting some locals to get a sense of where we were and how much longer it would take to get to the top. We only had our driver for 8 hours total so we were on a schedule. I'm pretty sure they laughed at us when they walked away.. like "These tourists have no idea what they're getting themselves into and they're already dead." I believe we had an extra 1KM and it was all stairs. OMG. We had a major pow wow as a group and I'm thrilled with our decision to turn around and go back. I've heard the views up top are epic but it was starting to get cloudy... The clouds are the only way I can justify why we didn't go.. it had nothing to do with the fact we were scared of 1K stairs and already smelly. Eye roll. We failed and it was probably due to the fact that I was complaining in my head the whole way to the second temple. I've read it takes 2 hours to hike up to the top and it may require one to be somewhat fit.. I'd like to think I'm fit but clearly not because the sad truth is, I woke up with sore calves (stop judging me.) I can't even imagine what my personal trainer back home would say! Sorry, Duke. The short climb we did was a rude awakening and I'm pretty sure a gym membership should be next on my to-do list. By the time we got back to the van we were all starving. At that point we didn't have breakfast and it was 9:00 am. I bought a sleeve of Oreos and a bag of white rice from a local. So random, but I was desperate. The Oreos were like heaven in my mouth. It didn't take long for me to put the whole sleeve down. On our way back to Canguu, we were only the road for a few minutes before I saw this amazing rice field. I remembered quickly a coworker showing an article while I was still at home. Apparently, a lot of people were seeking this field out to get an iconic picture of the volcano. As soon as I recognized the field both Kahlah (<-- she is one of our amazing program leads who happened to go with us. She's responsible for finding a driver and being a rock star photographer) and I asked the driver to stop the car. We quickly got out and started trekking through this rice field looking for the best view. The field was acres upon acres of rice all at different levels. We saw some locals waiving a red flag at us and at first, we thought they were upset with our trespassing but quickly realized they were happy and probably thought we were a little crazy. It was a bit muddy but the view was well worth muddy Birks. I remember getting back into the van and thinking "I feel pretty good for getting up at 3 am." It wasn't 10 minutes later we had all passed out for the majority of the ride home. The scenery and temple were totally worth the 3 am wake up call and 5 hours on the road. I would do it again in a heartbeat. NOTE: for anyone considering a trip to Pura Lempuyang Luhur here is some advice to consider. You shouldn't have to pay a driver per person but a total fee and for a certain number of hours. We paid 600,000 RP for one van that fit 5 people. This gave us 8 hours of round-trip transportation and time at the site. If you get car sick, make sure to take some motion sickness. The ride up the mountain is really curvy and a few times I felt really sick. Go early in the morning, you'll have better views and beat the heat. Sunrise in January is around 6:00 am. However, if it's a clear day and you can get there for sunset I think it would be unbelievable. Take a backpack with an extra pair of shoes for the hike. Maybe throw a bottle of water or two in there as well but if you don't want to carry it take some $$ so you can buy snacks and drinks along the way. While at Gates of Heaven there will be other people around. You need to be aggressive (without being rude of course) to get a picture or people will keep jumping in front of you. Go with an open mind and prepare to hike!! The rice field is on your way to the mountain. You can't miss it. Make sure you ask a local if you can enter. There were several people attending to the field and they'll welcome you with open arms. Don't be afraid of the volcano. If the locals are there, you should be too.